Happy Canada Day/Fourth of July/whatever else is worth celebrating this weekend! The blog returns on Wednesday. In the mean time, I'll leave you with a royal wedding (because hey, why not?). I mentioned earlier that King Carl Gustaf and Queen Silvia share their June 19th wedding anniversary with Crown Princess Victoria and Prince Daniel, but we mustn't forget another royal couple who tied the knot on that date: the Earl and Countess of Wessex! 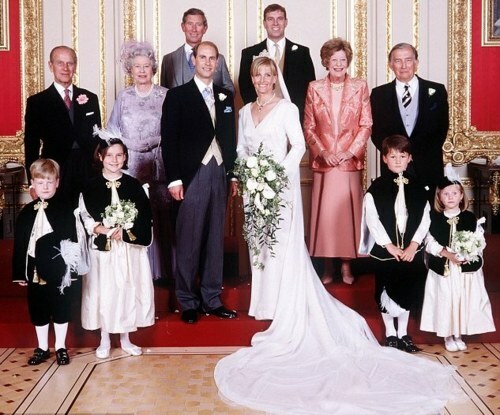 Sophie and Edward married at St. George's Chapel, Windsor Castle on June 19, 1999. The wedding featured a wedding coat dress by Samantha Shaw, some interesting jewelry choices from the bride, a bridal party decked out in wee cloaks inspired by the Order of the Garter gear, and a shake up from the normal British royal wedding dress code. (Check out my original dress post here.) It's a blast from the not-so-distant past. Enjoy! Video: Playlist with Edward and Sophie's wedding. Click here for a different broadcast.